Orlando, Florida – May 17, 2016 – On the first day of RAPID 2016, the largest US trade fair and conference on additive manufacturing and 3D printing, Additive Industries has announced the fifth MetalFAB1 system is sold to GKN Powder Metallurgy, the world’s leading manufacturer of precision automotive components. Additive manufacturing is maturing and ready to meet the globally recognized quality standards for production in the automotive industry. Additive Industries has the ambition to qualify its first truly industrial 3D metal printing system, MetalFAB1, for automotive series production. Jointly they will apply the MetalFAB1 system for industrialized automotive serial production compliant with ISO/TS 16949 standards at significantly higher productivity than ever before. 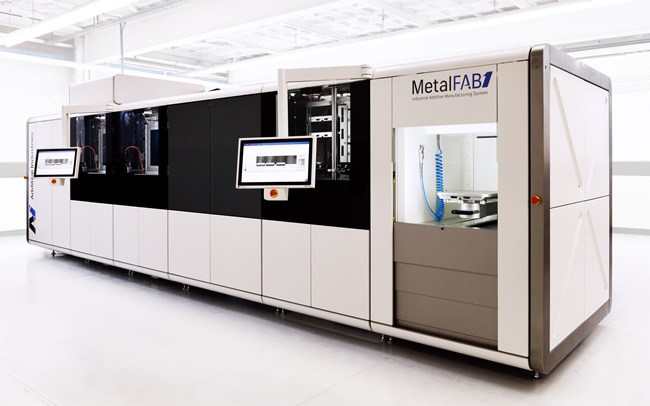 Although Additive Industries had already declared ‘sold out’ for their MetalFAB1 Beta systems, they decided to re-open the Beta programme and build a fifth machine. “For Additive Industries the input from an automotive leader like GKN is a beautiful addition to the other Beta customers from the aerospace and high tech equipment markets. Their unconditional focus on predictability and total cost is an important driver for further integration and optimisation”, according to Additive Industries Co-founder and CEO, Daan Kersten. Additive Industries is dedicated to bringing metal additive manufacturing for functional parts from lab to fab by offering a modular 3D printing system and seamlessly integrated information platform to high-end and demanding industrial markets. With substantially improved reproducibility, productivity, and flexibility, Additive Industries redefines the business case for additive manufacturing applications in aerospace, automotive, medical technology and high-tech equipment. This entry was posted in News and tagged Additive Industries, GKN Powder Metallurgy, MetalFAB1 system, RAPID 2016 by AM. Bookmark the permalink.